Ultra-mobile without Compromise? 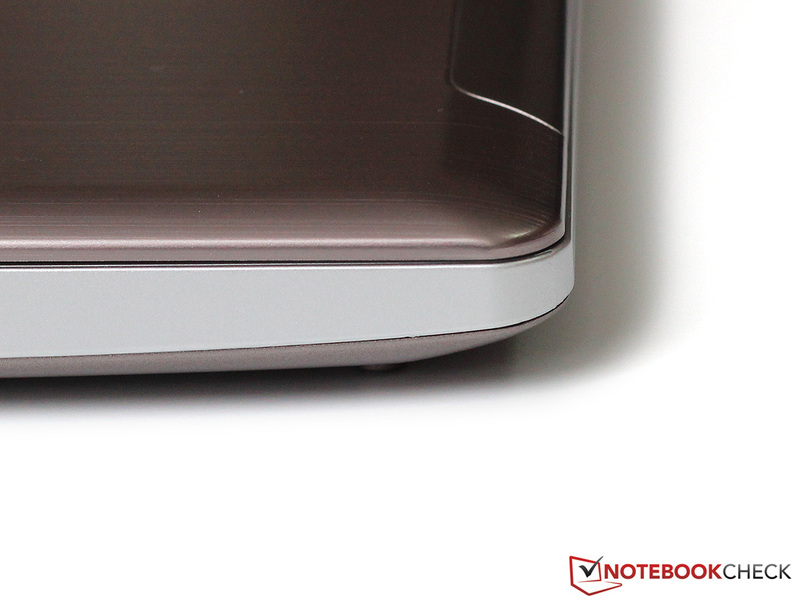 Ultrabook-slim yet high performance? The new Gigabyte U2442N promises just that and it delivers thanks to a HDD-SSD combo and the GT 640M graphics card. It has been a while since we tested a Gigabyte model. The Taiwanese manufacturer is famous for its motherboards and peripheral devices. 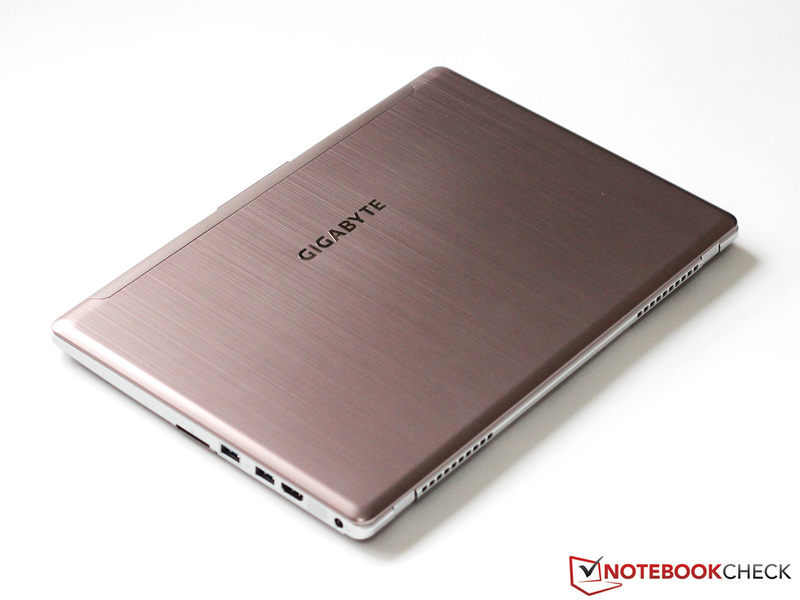 Gigabyte also offers a small selection of tablets and notebooks. The Ultrabook creator, Intel, prophesised a boom in the Ultrabook market in the near future and many manufacturers, including Gigabyte are investing in this area. 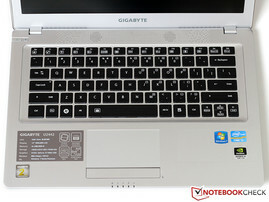 The new Gigabyte U2442 is a second generation Ultrabook which runs on the Ivy Bridge architecture. The U2442 series has a 14-inch display, and places alongside Ultrabooks like the HP Envy 14 Spectre and the Acer Aspire Timeline Ultra M3. 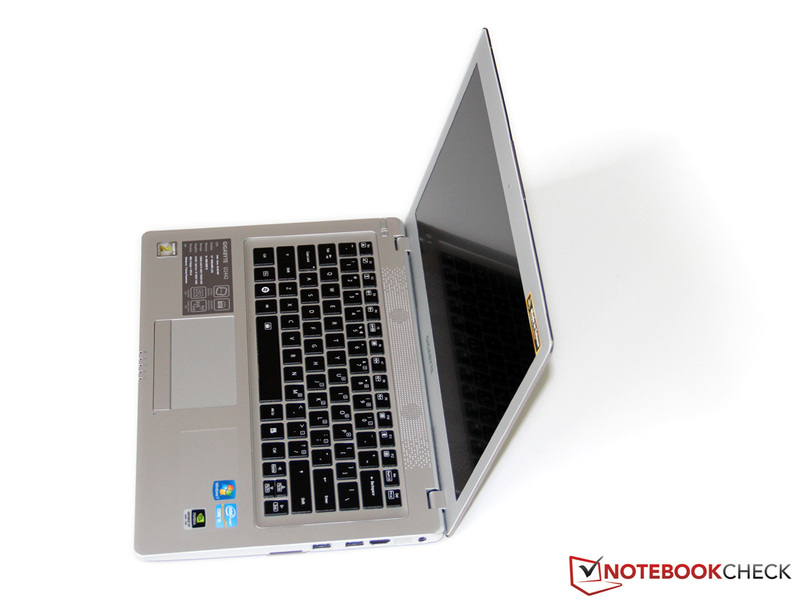 The notebook is not equipped with ULV components, but with a fast Core i5-3210M and the middle-class GeForce GT 640M graphics card. Officially, the U2442N cannot qualify as an Ultrabook with this hardware and only its sibling, the U2442V (identically equipped but with a ULV CPU - Core i7-3517U) can wear the title. The rest of the hardware is similarly potent: 8 GB RAM, a 128 GB SSD and a 750 GB hard disk. This hardware is top class, which brings us to the price: (starts at) 1200 Euro (~$1555) for the U2442N. 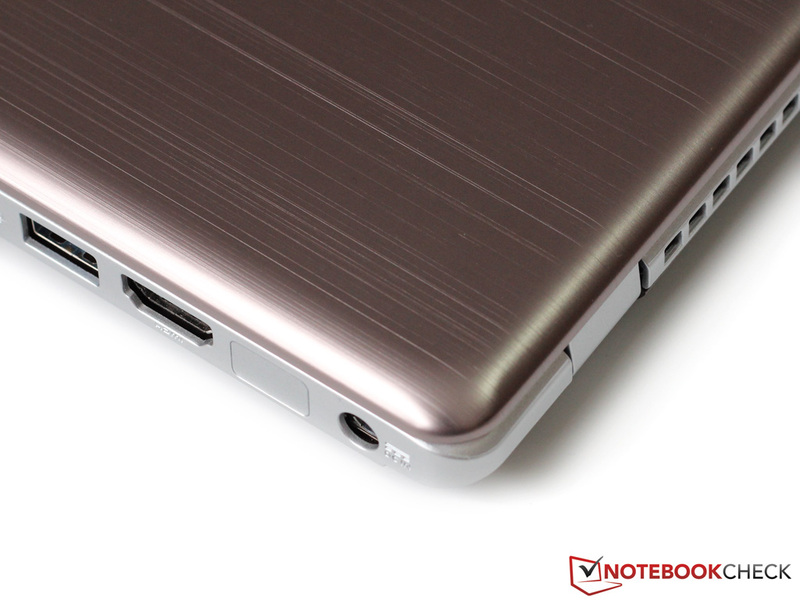 Other Ultrabooks are similarly expensive, so we will see what the test model can do in the following review. Made in Taiwan - the manufacturer is quite proud of this fact as can be seen by the large sticker on the top right of the screen. Our first impression is neutral: the silver-grey case is made of synthetic material and aluminum, yet it does not look as flashy as most competitors and may even be slightly drab. Thankfully, this is very practical as dust and smudges would be far more visible on darker (and even high-polished) cases. The bottom of the laptop is made of only plastic, yet it offers good sturdiness. The chassis bends slightly under the keyboard when excessive force is applied. With the exception of this, the test model is as sturdy as a laptop with a metal chassis. This is especially impressive as the U2442N is a mere 21 mm thick and weighs 1.69 kilograms/3.72 lb. (and without the HDD - a mere 1.59 kilograms/3.5 lb.). Overall, the test model is very mobile. However, if the display bezel was thinner (between 1.5 and 2.7 cm), the mobility could be increased further. 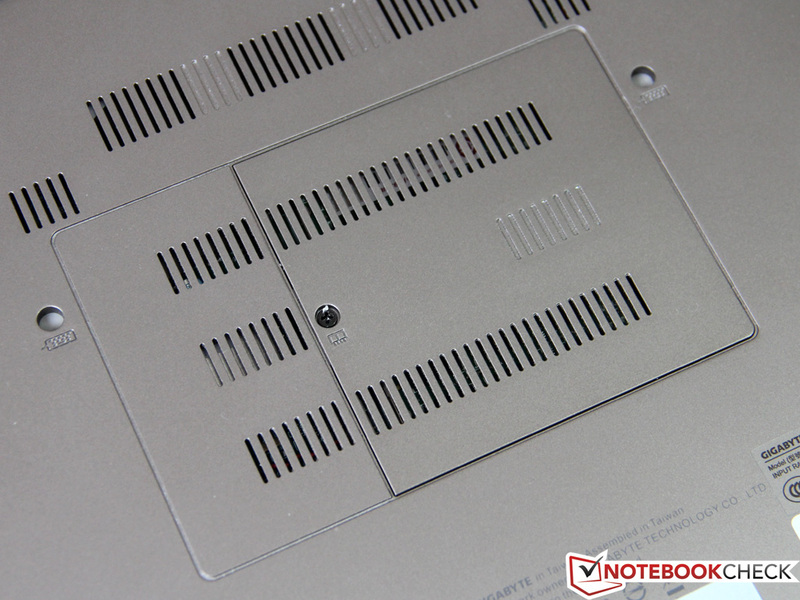 The back of the display is made of polished aluminum, as promised by the manufacturer. This ensures that the display is quite sturdy. 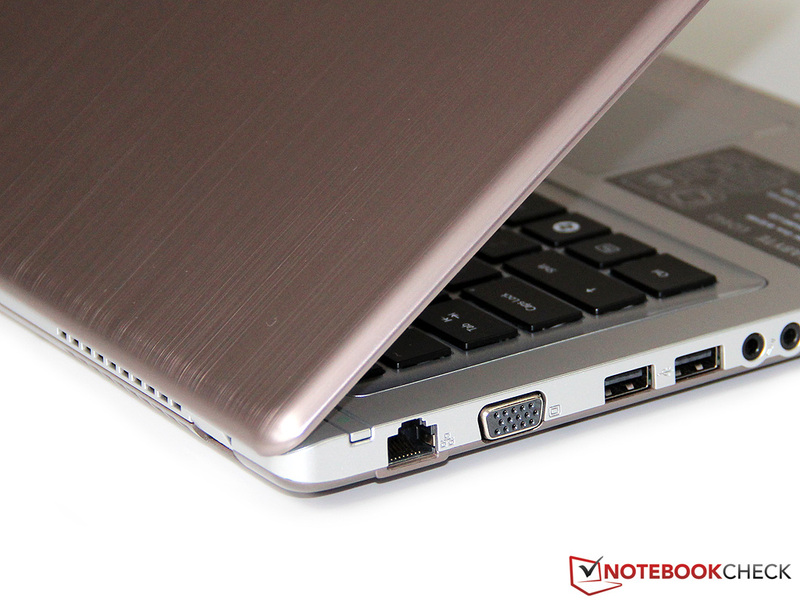 Thanks to the well-designed hinges, the laptop can be opened with one hand. On the other hand, when the laptop shakes, the display wobbles. We did not find any workmanship flaws like sharp edges, which results in the Gigabyte U2442 receiving a good score in this section. 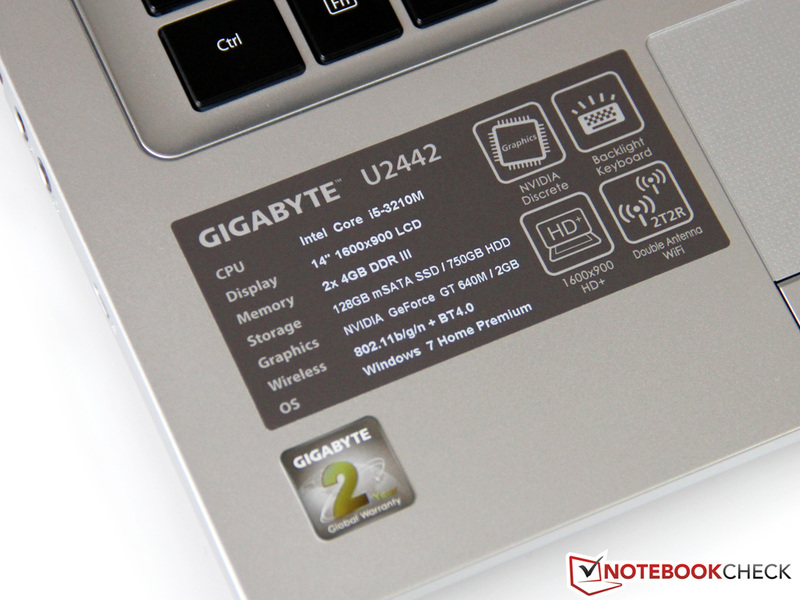 Like many other notebooks of 2012, the Gigabyte U2442N has two USB 3.0 interfaces. 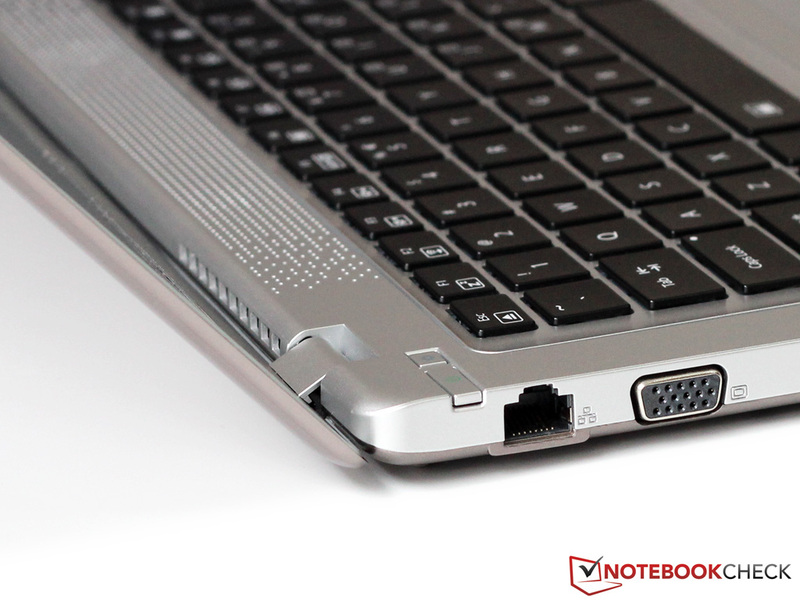 In addition, the laptop offers two USB 2.0 ports and this should satisfy most users. It is a real pity that the test model lacks a (Mini-) DisplayPort interface, but the user is provided with both a VGA and a HDMI interface. 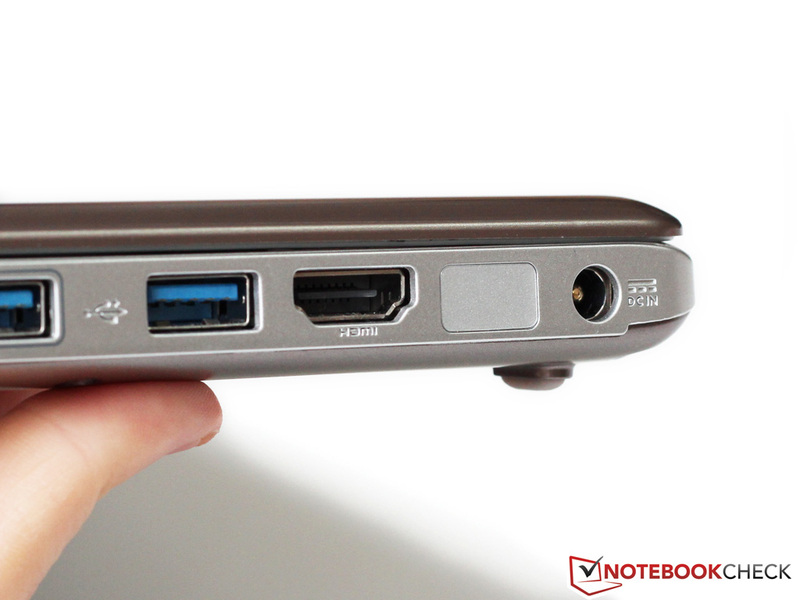 The test model has no optical drive, ensuring that all ports have sufficient space on the case. The layout chosen by Gigabyte is well thought out and practical: Gigabit-LAN, the power outlet and both display interfaces are placed towards the back of the case, whereas the USB ports (two on the left, two on the right) and audio jacks are placed towards the front. All the interfaces and the card reader, which can only read SD cards, can be used without issues. The Intel Centrino Wireless-N 2230 is a mini PCIe WLAN module, which offers features and performance appropriate for a middle-class device. The Multi-Stream technology (2x2) makes it possible to transmit and receive up to 300 MB/s, but only on the usually overcrowded 2.4 frequency. The model does not support the 5 GHz frequency which means that users are limited to just one band on IEEE 802.11b/g/n networks. The U2442N also has Bluetooth 4.0 (provided by the same module). This new standard of the wireless technology has a special Low-Energy mode and is supported by many modern Smartphones. As usual, a small 1.3 megapixels webcam is installed in the display bezel. It may not take sharp pictures but it suffices for use with Skype or similar programs. The integrated microphone is of similar quality, and, in most cases, the user will not require an additional microphone. We did not expect this: the manufacturer offers a typical delivery (manuals and a driver CD) and includes a stylish leather bag. Although the material is not very high-quality, most users will be happy about this small extra which ensures more protection for their device. The software extras are scarce. Thankfully, this means that the user will not have to uninstall unnecessary test versions. The obligatory Adobe Reader and Starter edition of Microsoft Office 2010 are pre-installed and can be accessed via desktop shortcuts. 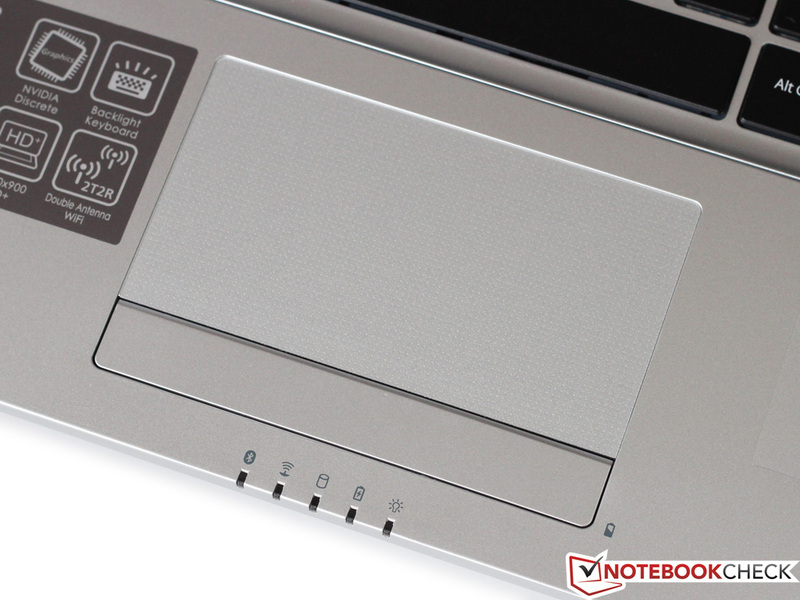 Few upgrade possibilities are a characteristic of compact notebooks. This applies to our test model as well. The bottom of the model has a flap, which is secured by a single screw, and covers both RAM slots. These slots are already occupied and upgrading to 12 or 16 GB is only possible after removing the installed modules. All additional components, including the integrated battery, cannot be removed easily. 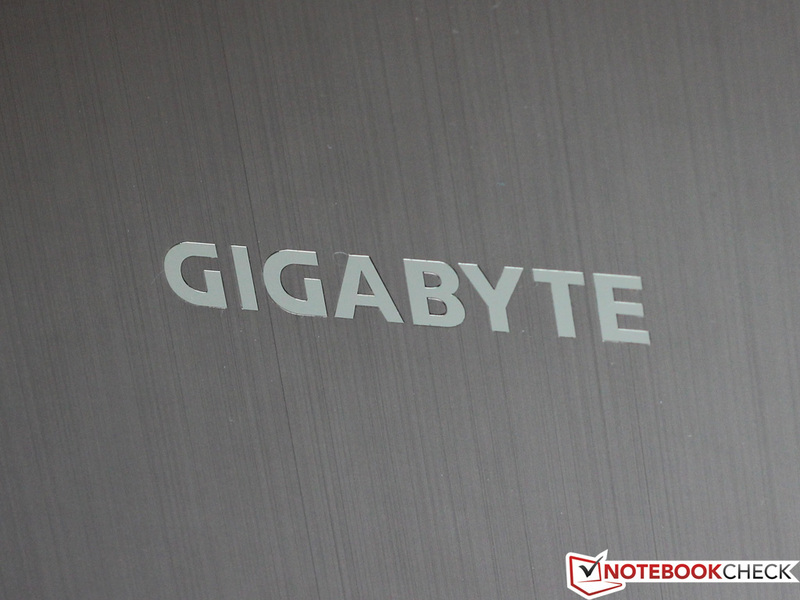 Gigabyte promises 2 years global warranty for the U2442N. 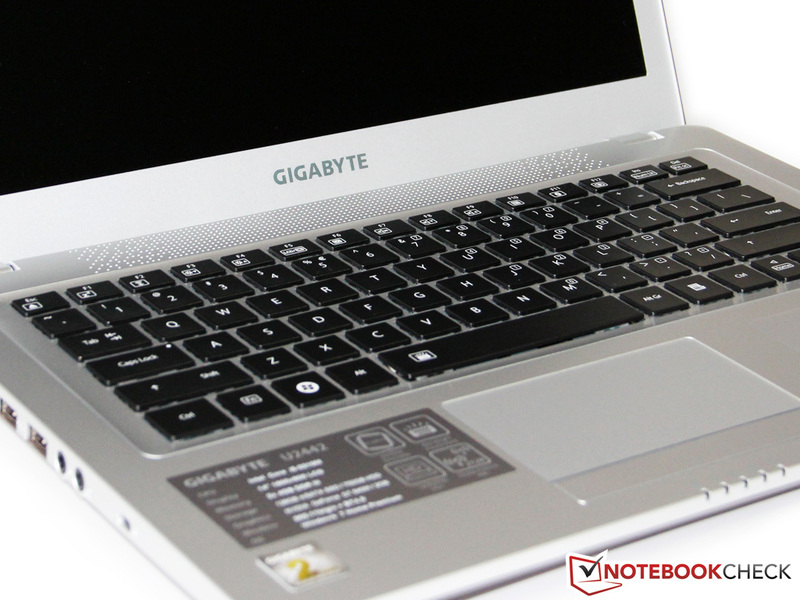 If the laptop should break down in a foreign country, the user can get it repaired on-site at a Gigabyte shop. We could not find any information or offers pertaining to an extension of the warranty. The chiclet keyboard is installed nicely, if not perfectly, in the chassis of the test model. The workmanship and sturdiness are very good and it did not bend much even under immense force. We did not appreciate the cheap quality of the material of which the 15x15 millimeter keys are made. The integrated backlight helps the user type easily in the dark which is a positive. Gigabyte has used a standard layout for the keyboard (US keyboard for our test model). The soft pressure point is noticeable while typing but, in our opinion, it does not provide enough feedback. 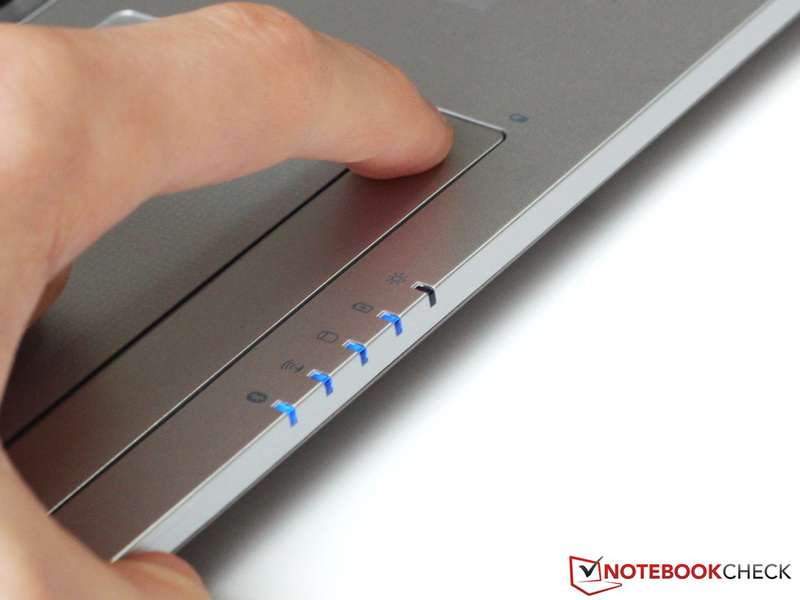 The pressure point is paired with a short stroke distance (typical for notebooks). The typing experience was diminished due to the steady clattering of the keyboard which accompanies high-speed typing. We expected much more of a notebook of this price range. 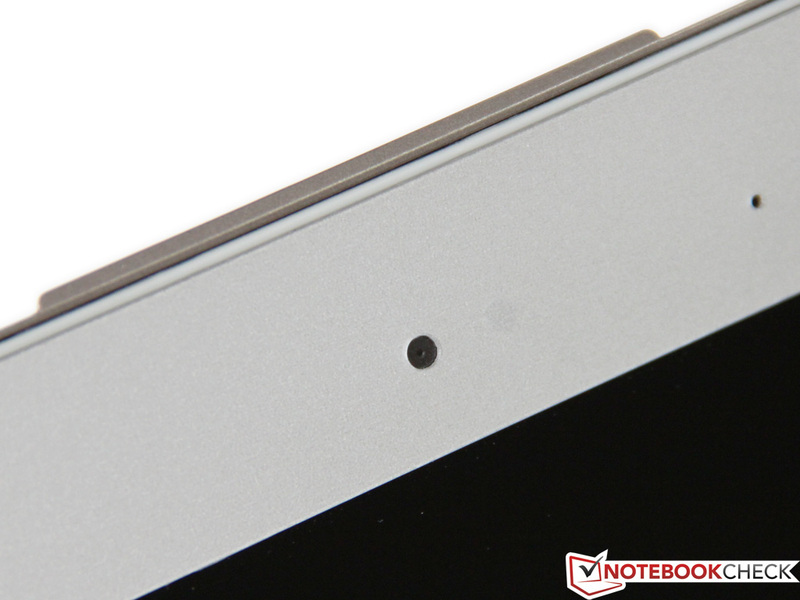 The Smart-Pad made by Elan performs better in our review. The device measures 5.3 x 9.6 centimeters, and although it is not very large, it has some good qualities. The rough surface reminds the user of Lenovo ThinkPads and may not be to the liking of all users, but the sliding properties are amazing, even with sweaty fingers. The precision and offered features are also quite good. The touchpad supports the typical multi-touch gestures which can be individually configured or de-activated (the touchpad can be switched off by pressing Fn + F10). A broad button below the pad performs the function of both mouse keys. The stroke distance is short, like the keyboard, but thanks to the strong pressure point the user can comfortably use the touchpad. 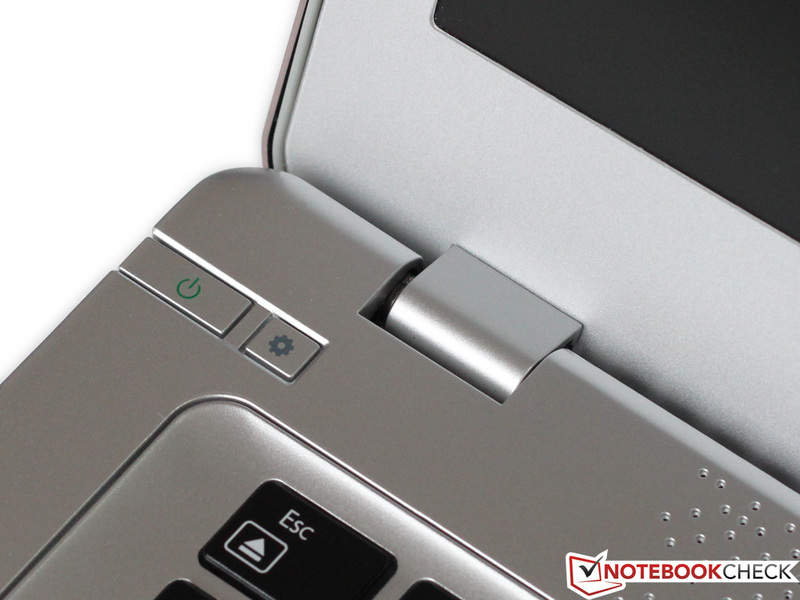 A practical feature: pressing the right mouse button while the laptop is off will show the battery charge. The 5 status LEDs are used for this task as well as for showing the activity of the wireless module while the laptop is on. 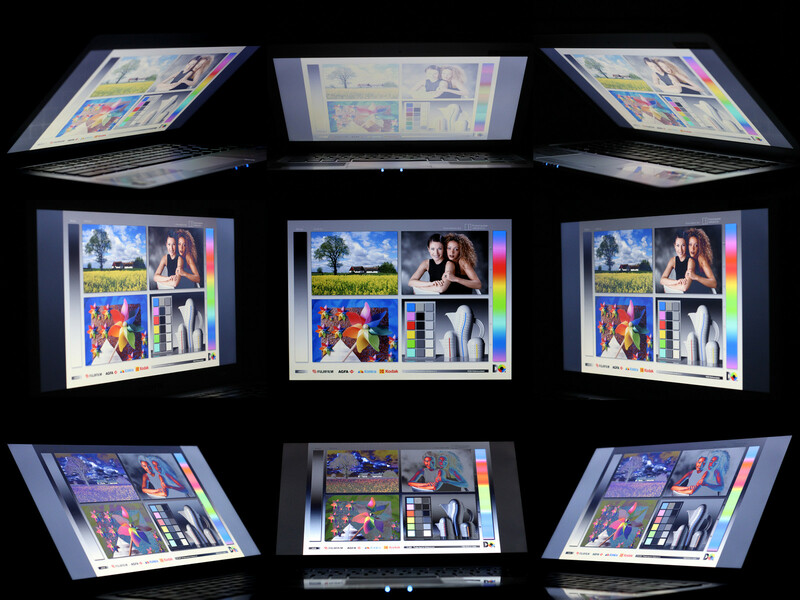 Gigabyte has picked a matte WXGA++ display for its 14-inch model. The screen has a resolution of 1600 by 900 pixels which translates to a nice pixel density of 131 dpi. This provides the user with a well-sized work space and an acceptable font size. At the maximum level, we measured an average brightness of 233 cd/m². Near the bottom of the screen, the brightness drops to a little above 200 cd/m², causing a slightly unbalanced illumination of 83 percent. However, in our use, this was only noticeable when looking closely and should not affect the everyday user. Buyers expecting a high-quality IPS panel like in the Asus UX31A or UX32VD, will be disappointed by the simple TN screen (LG LP140WD2-TLD2) of the Gigabyte U2442N. Sadly, although the black value (1.47 cd/m²) and contrast (161:1) are decent, they just cannot match the values of a high-quality panel. 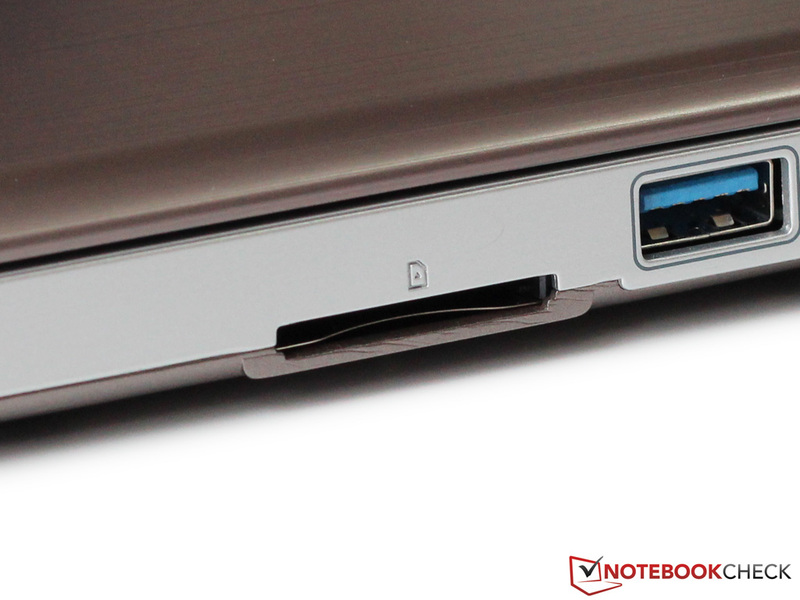 This is a common problem for many notebooks like the U300s from Lenovo. 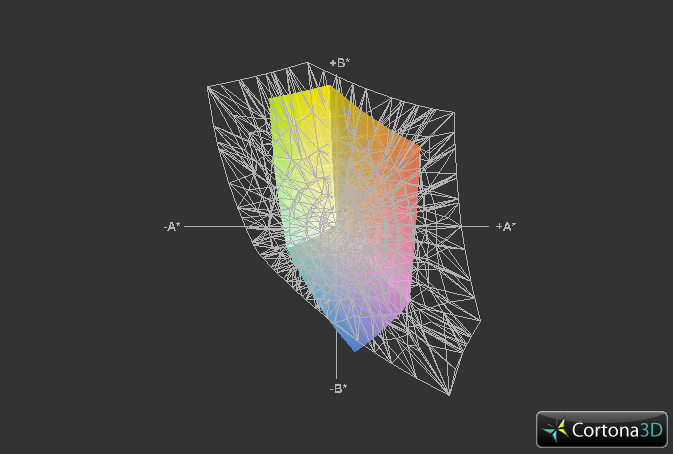 The limited color space coverage is another weakness. The sRGB and AdobeRGB standards, very important to photographers, are only partially covered. This means that the user would have to connect an external monitor for professional picture editing. In our test, we noted that the red shades were especially hard to differentiate from one another. The matt display surface will not cause too many distracting reflections during outdoors use. However, the brightness, which is already quite low, drops 10% while the laptop is running on battery, making the use of the laptop outdoors in direct sunlight quite hard. We would have liked to have a brightness of at least 250 to 300 cd/m² for outdoors use. The Samsung 900X4C is a good example. After finding so many weaknesses, we expected the TN panel to perform below average in the viewing angle stability test. Our suspicion was confirmed: even the slightest movements from a central sitting position can deteriorate the picture quality significantly. This applies to both horizontal and vertical viewing angles. The U2442N is not the ideal choice for viewing a movie with many friends. Buyers who want to use an external monitor with the laptop should get one which has a HDMI interface. Although the VGA output is clear, the picture is tinted slightly yellow. 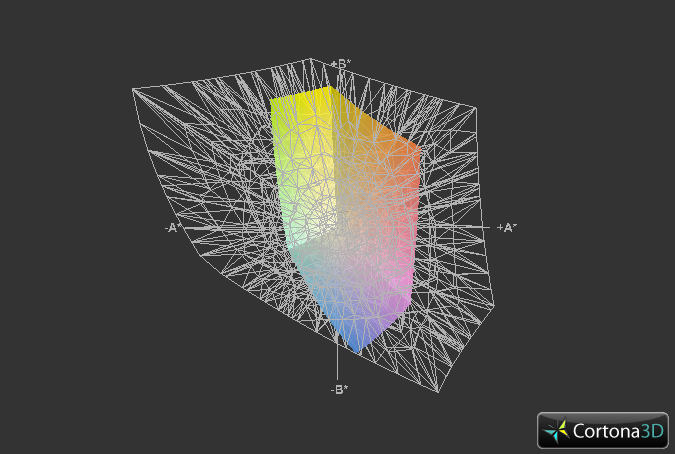 The color settings in the graphics driver can be used to ameliorate this issue. An Ultrabook should use a ULV CPU by definition. 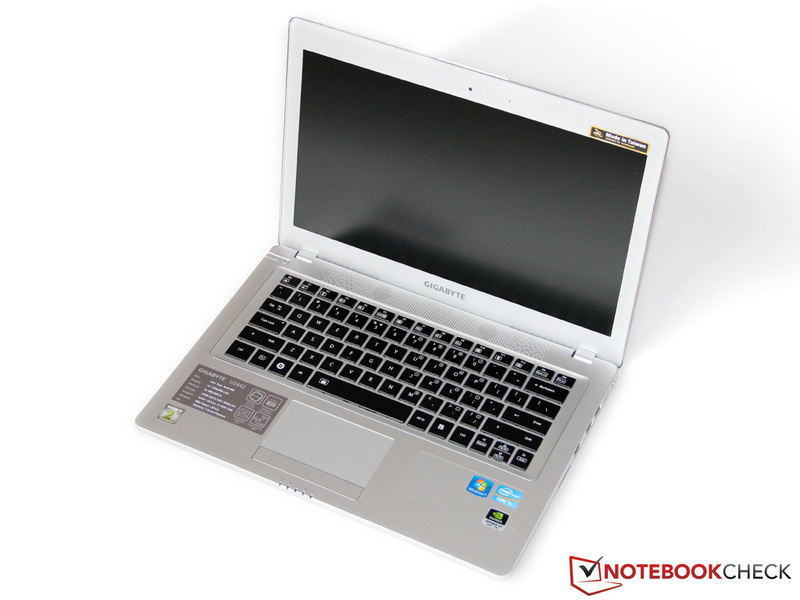 That is why only the sister model U2442V (Core i7-3517U) carries the title of Ultrabook. The U2442N is equipped with a faster processor which has a 35 W TDP (ULV: 17 W): the Core i5-3210M. 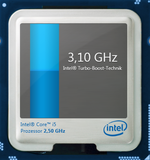 This 2.5 GHz dual-core processor belongs to the Intel Ivy Bridge generation and is manufactured using the 22 nanometer process. As all processors of the Core i5 series, the 3210M supports Hyperthreading (parallel processing of 2 threads per core) and Turbo Boost (1 core - 3.1 GHz, 2 cores - up to 2.9 GHz). Gigabyte continues to surprise us with the graphics card. 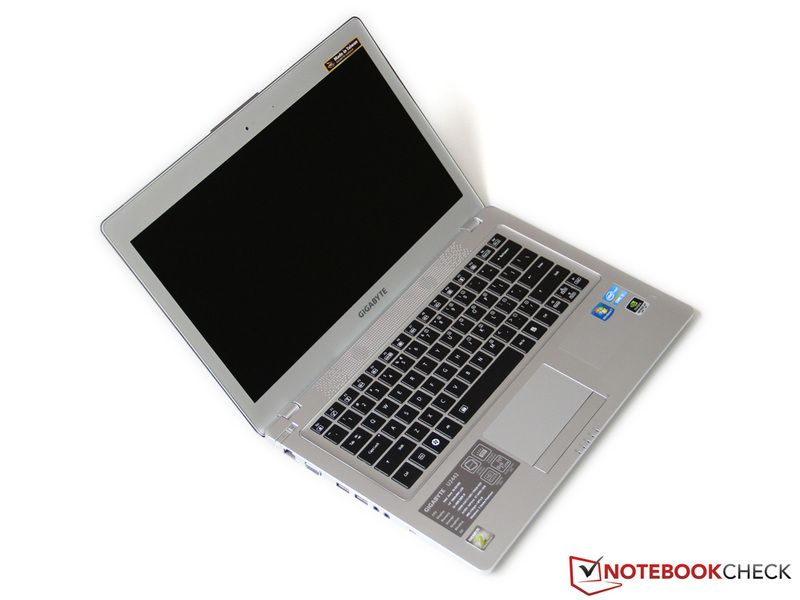 The HD Graphics 4000 integrated graphics chip of the CPU is only used while the laptop is idle or for video processing. More demanding 3D applications make use of the much more powerful GeForce GT 640M. The Nvidia Optimus technology allows the laptop to automatically de-/activate the dedicated graphics card depending on the application, so as to ensure the longest battery life possible. The laptop is also generously equipped with 8 GB RAM (2x 4 GB DDR3-1333 - double that of most Ultrabooks) and a 750 + 128 GB HDD-SSD combination. 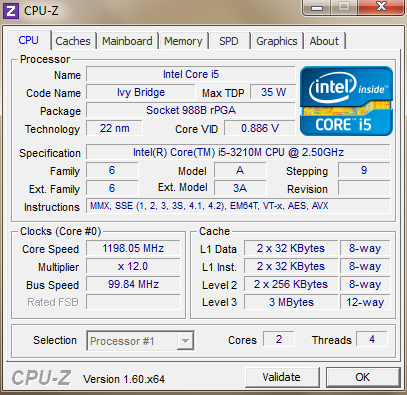 The Core i5-3210M is based on the same chip as the Core i5-3317U, which can be found in many of the competing models. 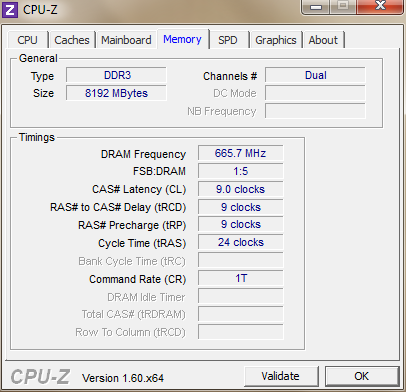 The difference in performance is caused by the differing clock speeds. Our 35 W CPU takes the lead in terms of performance. 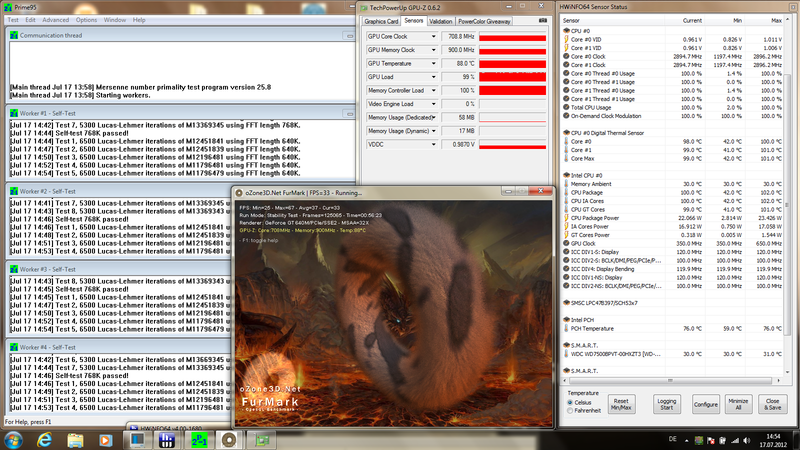 The processor scores 2.91 points in Cinebench R11.5, which places our model ahead of the i5-3317U by around 20%. Even in single-thread benchmarks, as well as the corresponding tests of Cinebench R10 (all 64 bit - our test model scored 5,312 points), the difference in performance is about the same. The U2442N makes the most of the maximum Turbo Boost which results in the great performance. We did not notice any drops in performance even in battery mode. What should you do if a SSD is just too small, but a HDD is too slow? Well, why not combine the two. 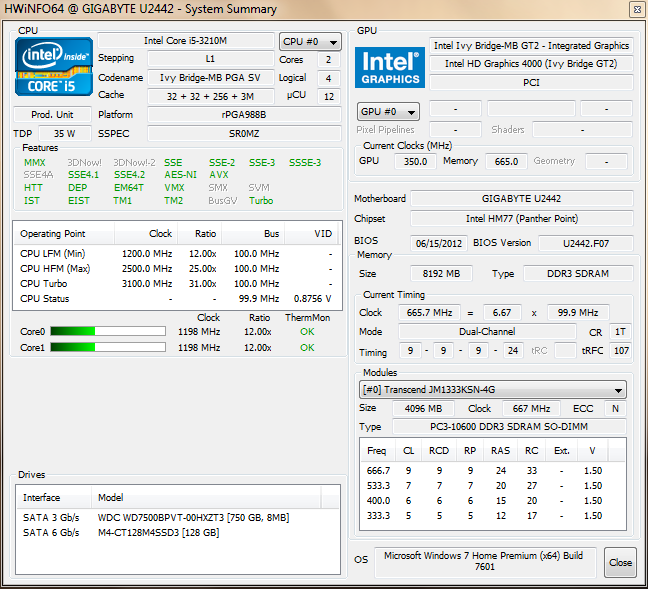 Gigabyte has installed a 750 GB hard disk (9.5 mm SATA) and a fast 128 GB SSD (mSATA) in our test model. Both drives present themselves as partitions to the user and the SSD is the system drive. The capacity is slightly lowered due to hidden recovery and hibernation partitions. This means that the user can only access about 100 GB of the storage space (minus operating system and pre-installed programs). 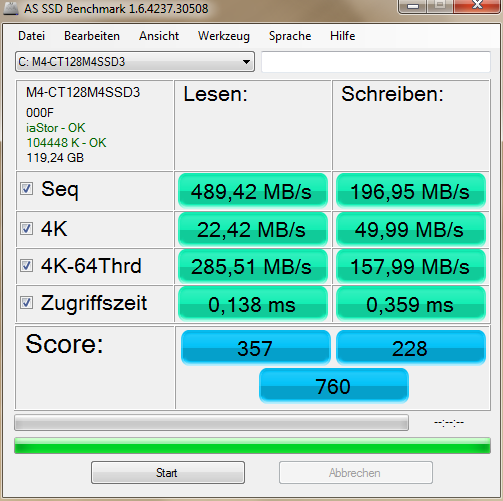 The Crucial's RealSSD M4, found in our U2442N, is one of the fastest SSDs on the market: nearly 500 MB/s (read) and about 200 MB/s (write - AS SSD sequential test). Even the performance with small 4K files is amazing - thanks to the short access time. 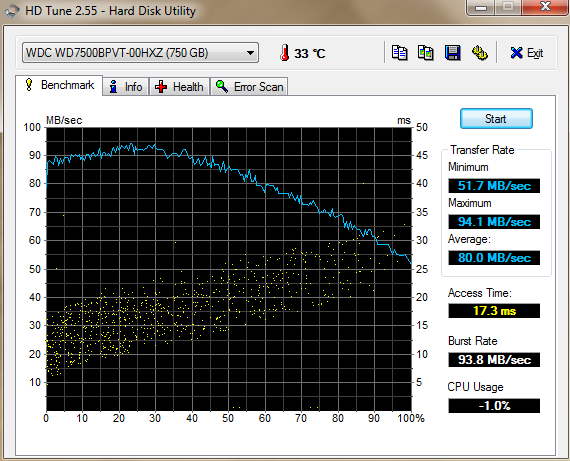 The hard disk, a Western Digital Scorpio Blue, cannot keep up with such speeds. It operates at 5400 rpm and has decent transfer speeds: average of 80 MB/s. This makes it a good choice for storage of pictures, music and movies. 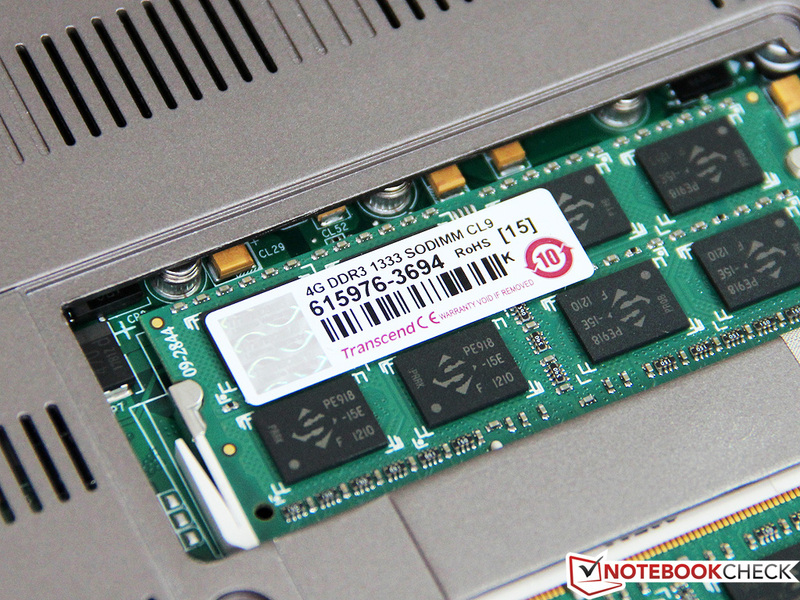 Our synthetic benchmarks prove that the Core i5-3210M and Crucial SSD duo deliver an amazing performance, leaving most Ultrabooks behind. In PCMark Vantage, the test model scores 14064 points and in PCMark 7 the laptop reaches 3667 points which are quite impressive. Only a few, true quad-core models can beat the U2442N. In everyday use, this great performance proved quite beneficial. The laptop is ready for use after 20 seconds of pressing the power button and most programs open in split seconds. All this without the user having to sacrifice storage capacity, as the large HDD should offer more than enough space. The higher CPU performance in comparison to Ultrabooks is noticeable in our benchmarks. However, this gap in performance affects everyday use very little. The user will only notice a clear difference to the popular Core i5-3317U when running very demanding programs. High graphics performance is alien to most Ultrabooks. The Gigabyte U2442 series breaks the norm, and is similar to the Acer Aspire Timeline Ultra M3 (tested earlier this year). The Acer laptop and the Gigabyte U2442 series (U2442N and U2442V) use the Nvidia GeForce GT 640M, a middle-class graphics card based on the Kepler architecture. The technical specifications of the 28 nanometer GK107 chips have not changed: a total of 384 shaders and 32 TMUs run at 625 MHz. In addition, depending on the temperature, the Turbo can boost the clock frequency up to a maximum of 709 MHz. The graphic card uses slow DDR3-VRAM (2 GB, 900 MHz) via a 128 bit memory interface. Overall, the U2442N is as fast as the Timeline Ultra M3 and scores 1837 points in 3DMark 11. In comparison to the AMD competition, the GT 640M places just ahead of the Radeon HD 7730M, and lags behind the Nvidia Geforce GT 650M by around 30 percent. We have extensively tested the gaming performance of the GT 640M in the past. As such, today we will limit the gaming test to a few games. We would like to mention that the graphics card is usually too slow to provide a fluid experience at the native resolution of 1600x900 pixels - at least at maximum graphics settings. 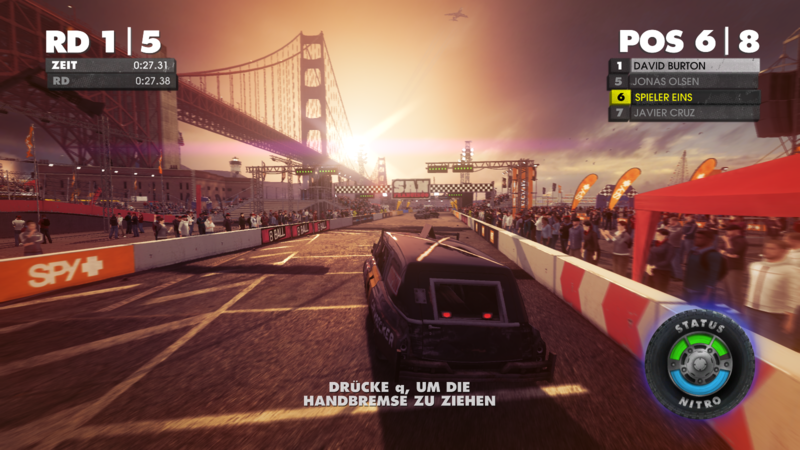 We will run three games: Deus Ex: Human Revolution, Anno 2070 and Dirt Showdown. 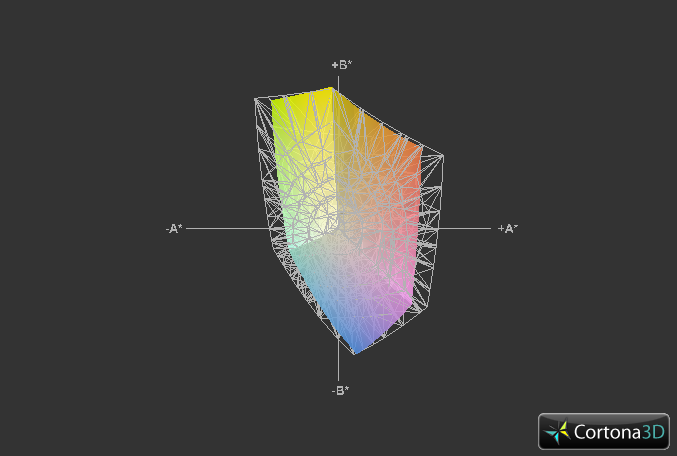 We picked high graphics settings, a resolution of 1366x768 pixels and low AA (Anti-Aliasing). The laptop runs the games with these settings at: 32 fps (Anno 2070) and 62 fps (Deus Ex). This provides an ideal compromise between graphics and performance for each genre. The third-Person shooter, Alan Wake, proves to be far more demanding. The game could only run fluidly at the XGA resolution (1024x768 pixels) and low settings. 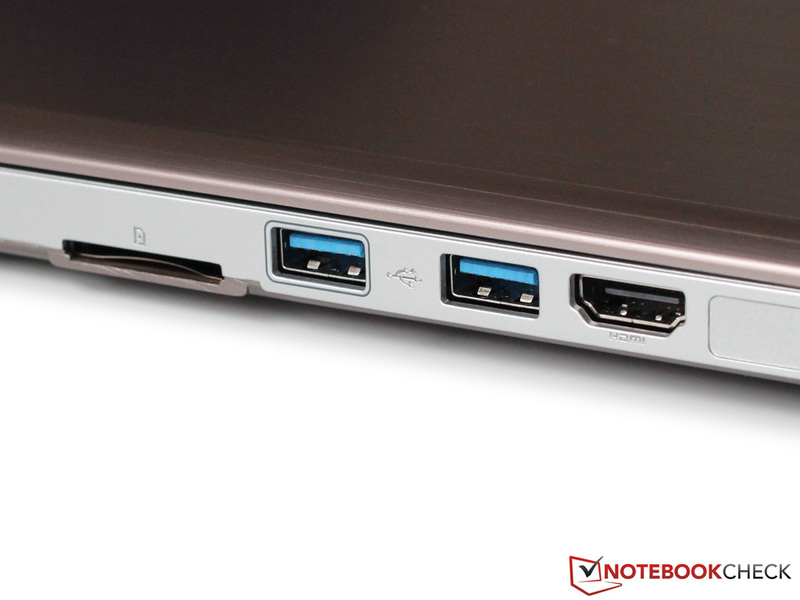 Many competing Ultrabooks rely solely on the HD Graphics 4000 IGP and are usually about half as fluid as the U2442N. 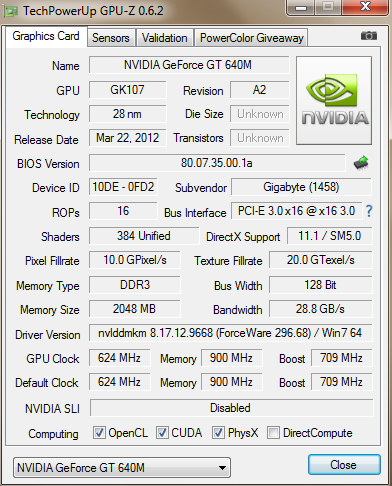 As such, we would like to conclude that the dedicated GeForce GPU is a very nice bonus. The summer heat wave spared our lab and the surrounding temperature for the emissions test of the Gigabyte U2442N was around 28 degrees Celsius. This resulted in both cooler fans of the test model constantly running (even in idle mode). The resulting noise emission ranged between 33.5 to 36.1 dB(A). A few days later, the temperatures dropped (around 23 degrees Celsius), and occasionally the fans shut off, leaving the laptop almost silent. The access noises of the hard disk are practically not audible from a normal seating position. Even at load, the high temperatures contributed significantly to the high noise emissions. Our measurement device read 45.5 to 47.9 dB(A) (3DMark 06 and stress test). Taking into consideration the slim build and the high performance of the U2442N, these numbers seem reasonable. The high surrounding temperatures heat up the case of our test model additionally. The hand-rest regions remain exceptionally cool, regardless of the state of the hardware, at 32 degrees Celsius. The laptop gets much hotter above the keyboard, where the chassis can reach up to 38 (idle) and 59 degrees Celsius (stress test). We would like to mention that these values are not directly comparable to those of other tested models. At normal room temperature, while running everyday applications, the U2442N does not heat up too much and can be used on the lap. 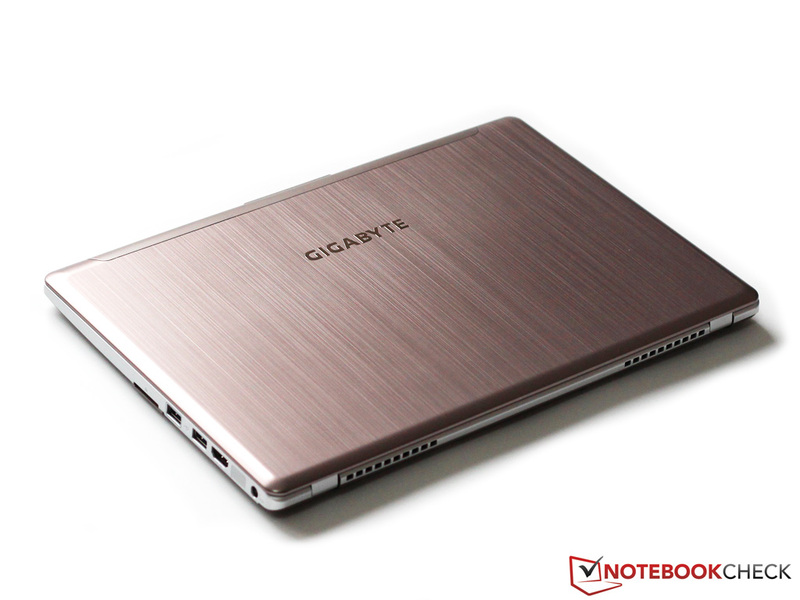 Gigabyte has integrated a powerful cooling system in the laptop which quickly and efficiently pushes the heat out of the system. After an hour of stress testing (Prime95 and FurMark, 23 degrees Celsius surrounding temperature) the CPU barely broke the 100 degree mark, but it ran at a constant 2.9 GHz. The graphics card is slightly cooler at 88 degrees Celsius and remains stable at maximum clock speed of 709 MHz. In practical applications, throttling should not be a problem. (-) The average temperature for the upper side under maximal load is 42.8 °C / 109 F, compared to the average of 30.9 °C / 88 F for the devices in the class Multimedia. (-) The maximum temperature on the upper side is 58.7 °C / 138 F, compared to the average of 36.5 °C / 98 F, ranging from 21.1 to 71 °C for the class Multimedia. (±) In idle usage, the average temperature for the upper side is 35.4 °C / 96 F, compared to the device average of 30.9 °C / 88 F.
The two stereo speakers of the Gigabyte U2442N are hidden above the keyboard. These speakers are not what one would be expect to find in a 1200 Euros (~$1555) notebook. The high notes show distortion, whereas the middle notes are tinny and the bass is non-existent. The maximum volume is quite limited and is only slightly louder than room level. We recommend the use of a pair of external speakers or headphones (3.5 mm audio jack) or a Hi-Fi system (HDMI). Thankfully, the speakers are sufficient for normal office use. 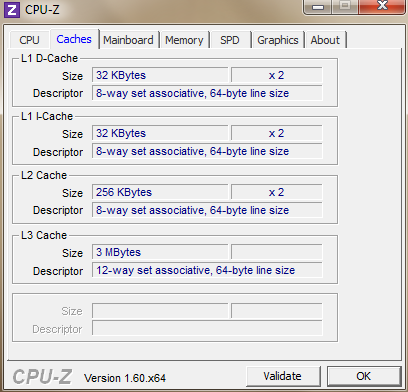 Thanks to automatic graphics switching, the U2442N should be quite conservative while idle. 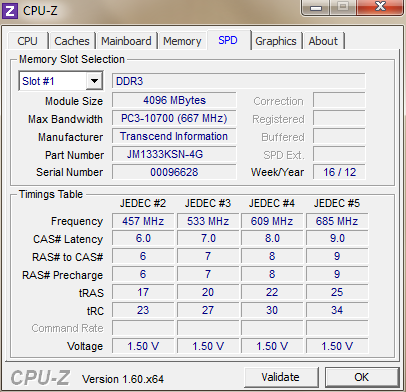 However, due to the two storage drives and large RAM modules, the idle power consumption rises slightly. 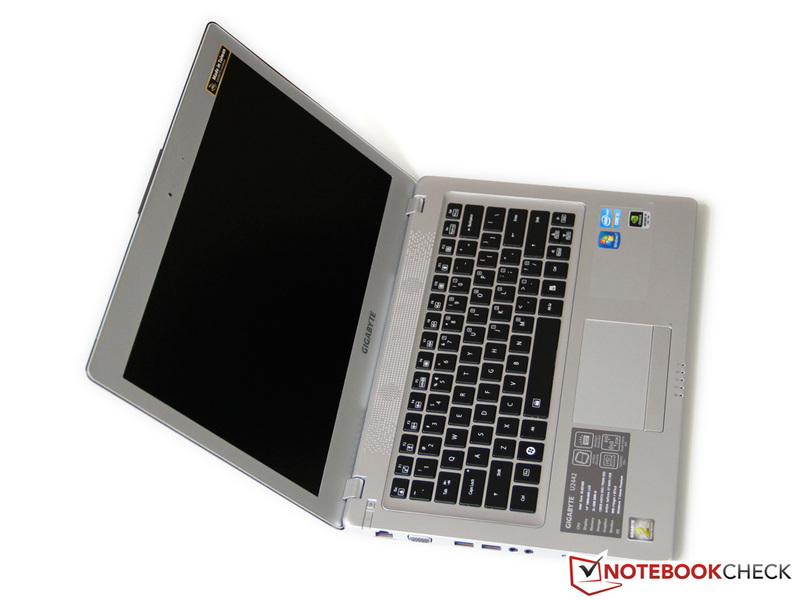 On average, the Gigabyte laptop consumes between 9.7 to 14.5 W and is not as conservative as most competitors, which require a mere 5 to 10 W (Toshiba Satellite Z830). At load, the gap widens, mainly due to the additional dedicated graphics card and power-hungry 35 W CPU of our test model. In 3DMark 06 (65.5 W) and during the stress test (Prime95 and FurMark - 70.5 W), the power consumption of our test model is about double that of a typical Ultrabook using ULV hardware. Gigabyte has compensated for the higher consumption by providing a strong 90 W power adapter for the U2442N. 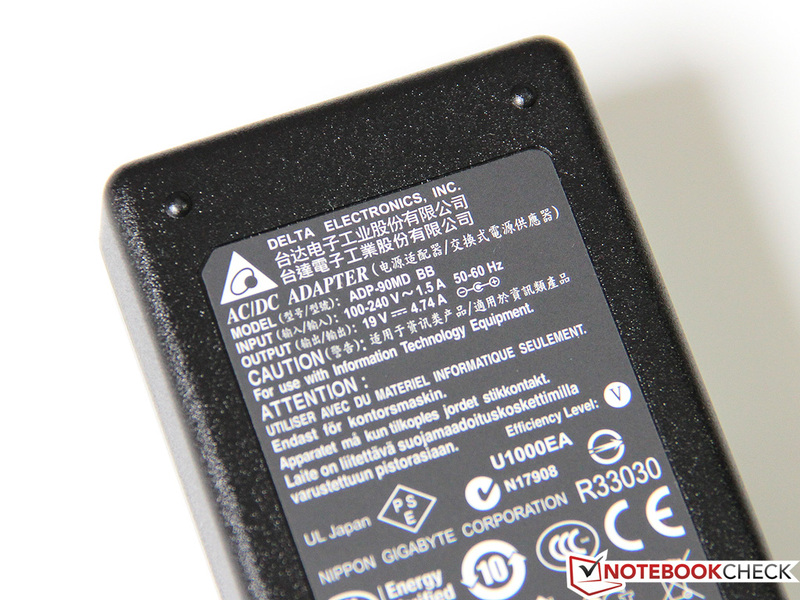 A weak 44 Wh battery (securely integrated) provides energy to the laptop. 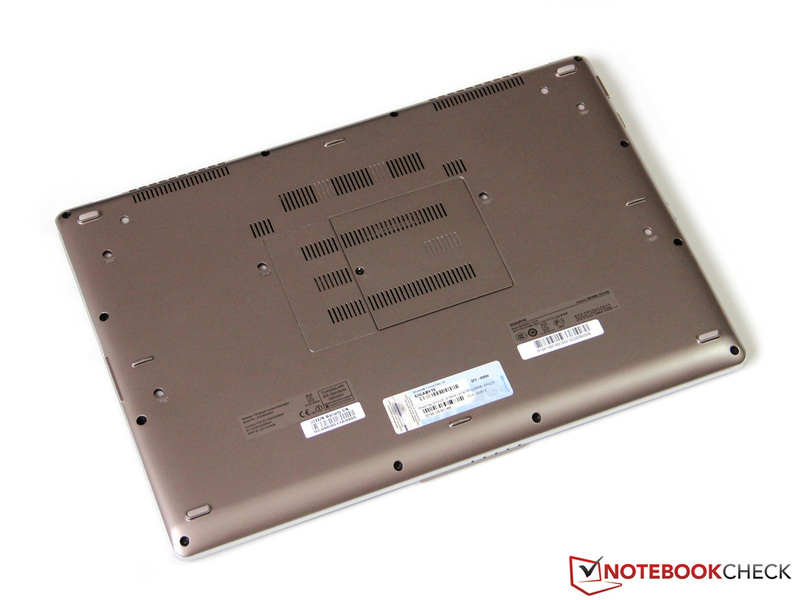 In contrast, the 14-inch HP Envy 14 Spectre uses a larger 58 Wh battery, which ensures longer run times. The difference is noticeable in the Battery Eater Readers test ("Power Saver" mode, minimum brightness and wireless modules off). The test model runs 6 hours (HP: 9 hours), which may seem a lot at first, but consider the fact that the laptop is only simulating the reading of a text file. This will probably not occur that often in everyday use. 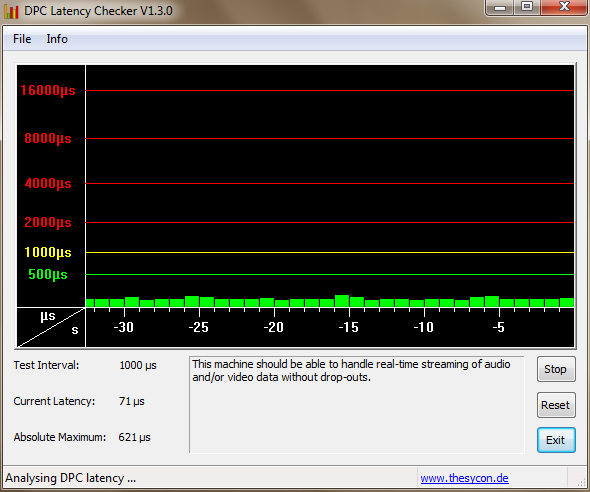 A more realistic value is found in the WLAN test (websites and videos are loaded every 40 seconds). With wireless modules turned on and at a brightness of 150 cd/m², the run time drops to 3 hours and 37 minutes. 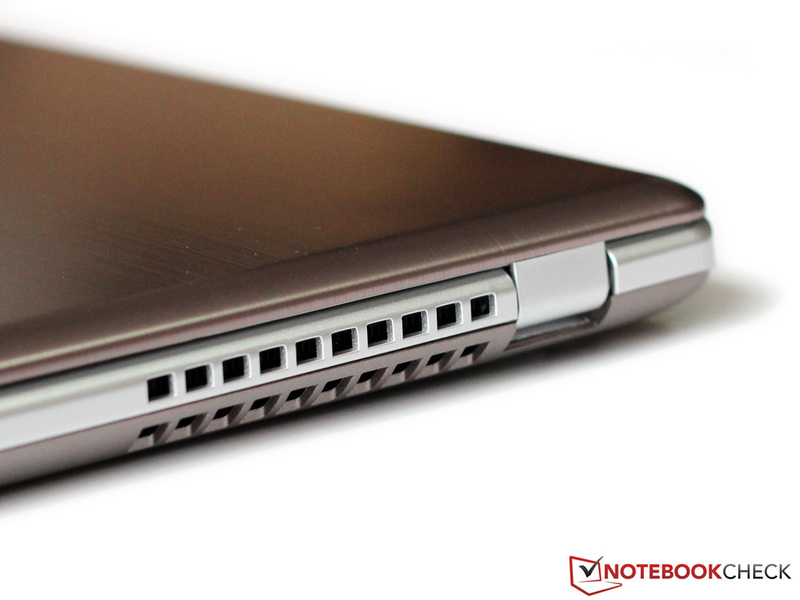 This means that the notebook can last about half a workday (HP: 4 hours and 45 minutes). Our last test is the Battery Eater Classic test ("High Performance" mode, maximum brightness, wireless modules on and Nvidia GPU on). This test should provide us with an estimate of the battery life while running 3D applications. Although a modern graphics card is not pushed to its limits by the outdated tool, the battery reserves are depleted after 1 hour and 21 minutes (HP: 2 hours). The laptop requires 2 hours to charge fully. 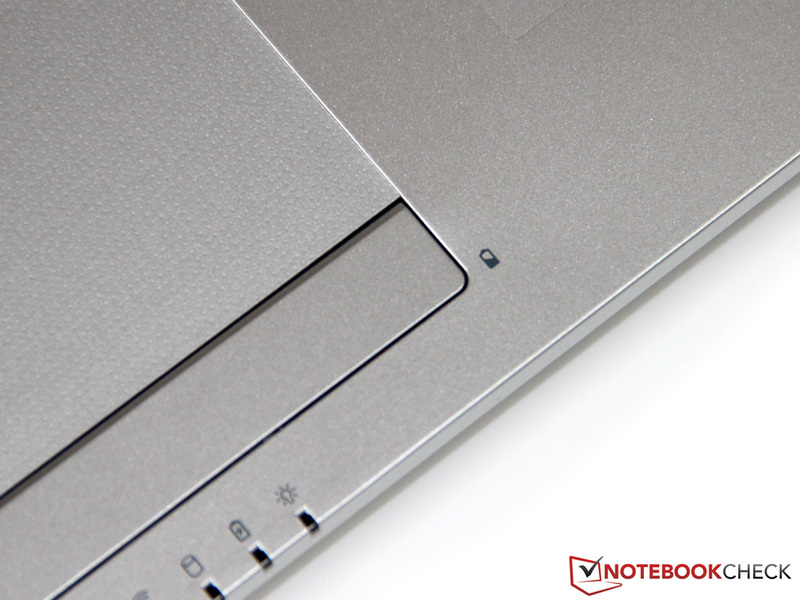 It has barely been a year since the first Ultrabook came to the market. 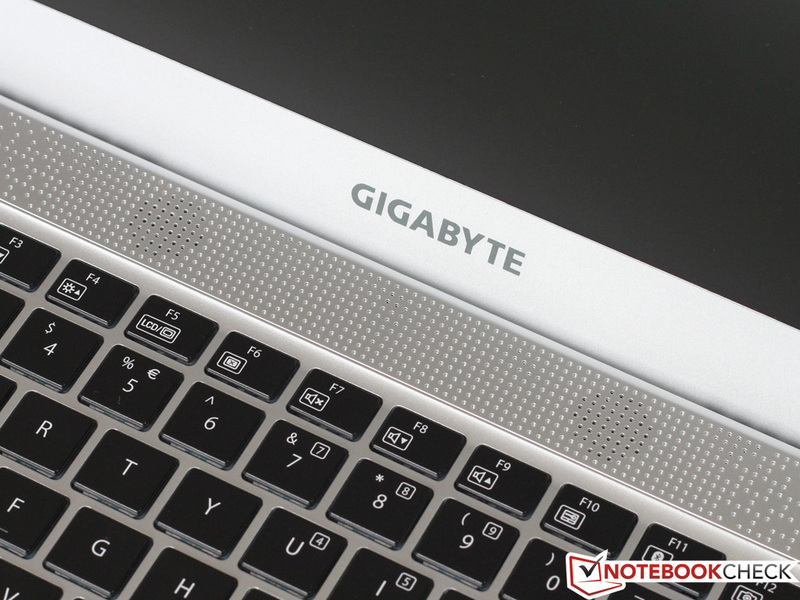 In this short time, numerous different models from all large manufacturers have made their way to our test table and now it is time for the Gigabyte U2442N (although officially, it is not an Ultrabook). 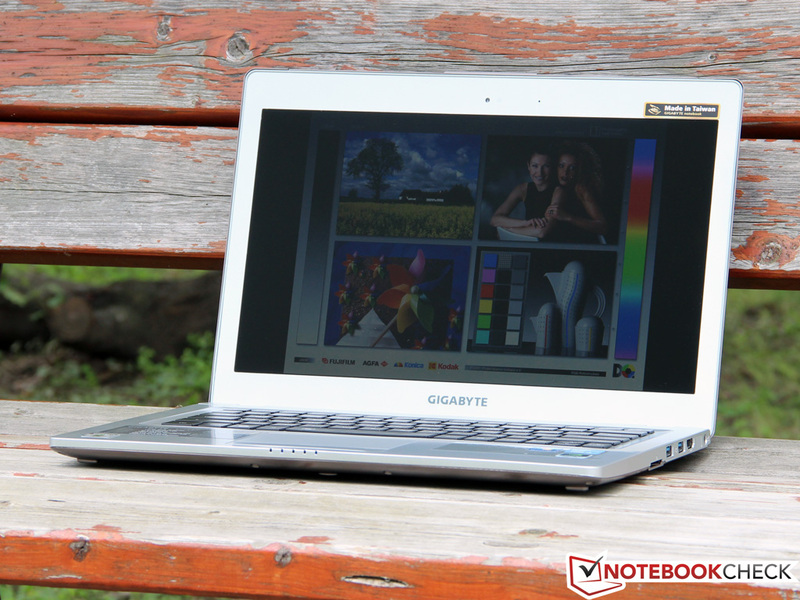 Gigabyte has a trump card on its side: in terms of performance, no other Ultrabook can compete with the combination of a Core i5-3210M with the GeForce GT 640M. The 14-inch model also has a great storage system, which provides the user with speed and capacity. Most Ultrabooks can only offer one or the other. The U2442N is more than just a mobile multimedia laptop - it even fulfills a few gaming needs. Sadly, the manufacturer could not combine these interesting qualities into an irresistible package. The test model costs 1200 Euros, yet it uses a 0815 display, a rickety keyboard and office-class speakers. The case, which is composed mainly of synthetic material, could have been of better quality. Worst of all, the small 44 Wh battery does not grant this laptop, specifically designed for mobility, a lot of time away from the power socket. 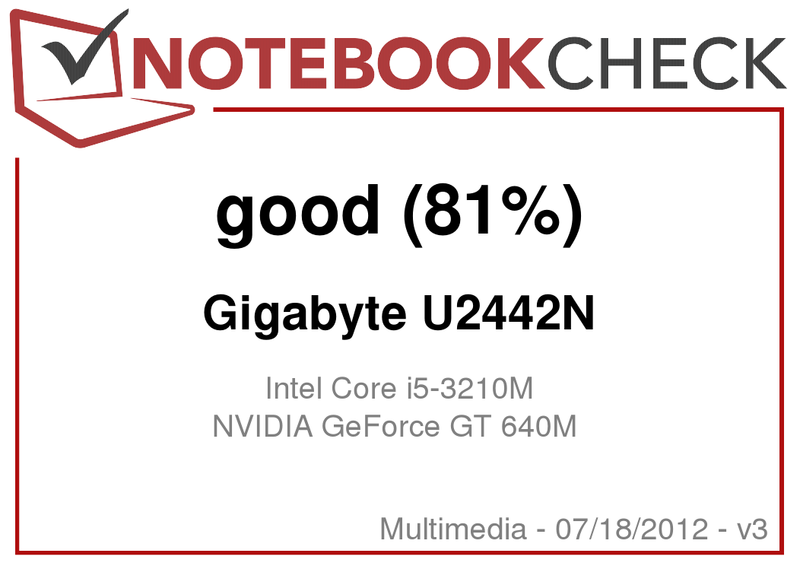 The Gigabyte U2442N is not a bad notebook. Buyers looking for an all-rounder with nice performance reserves, and the ability to run a few games at high settings, should take a look at this test model. However, if you are interested in mobility and battery life, a "classic" Ultrabook, like the Asus UX31A, would be a better choice. Thankfully, the keyboard is backlit. the charge of the laptop is shown on the press of a button. and there is more than enough space on the HDD and SSD. but two fans (left and right on the notebook). Both slots are occupied by a 4 GB module. as is the rickety keyboard. Was a DisplayPort interface ever planned for this model? and it is ready to step into the Ultrabook class. the manufacturer has picked a 14-inch display for the test model. whereas the base of the laptop mainly employs synthetic material. and even the slim design is nice. 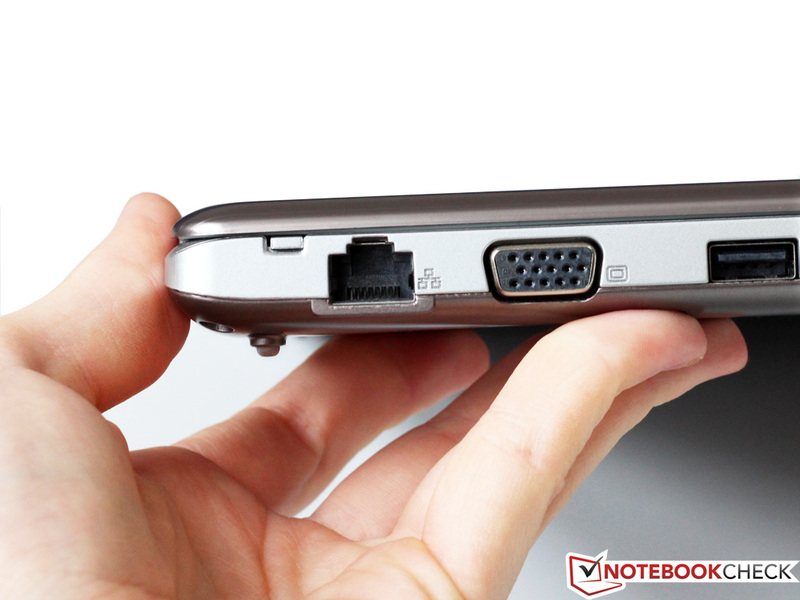 and a Gigabit LAN interface - all ports not found on most Ultrabooks. 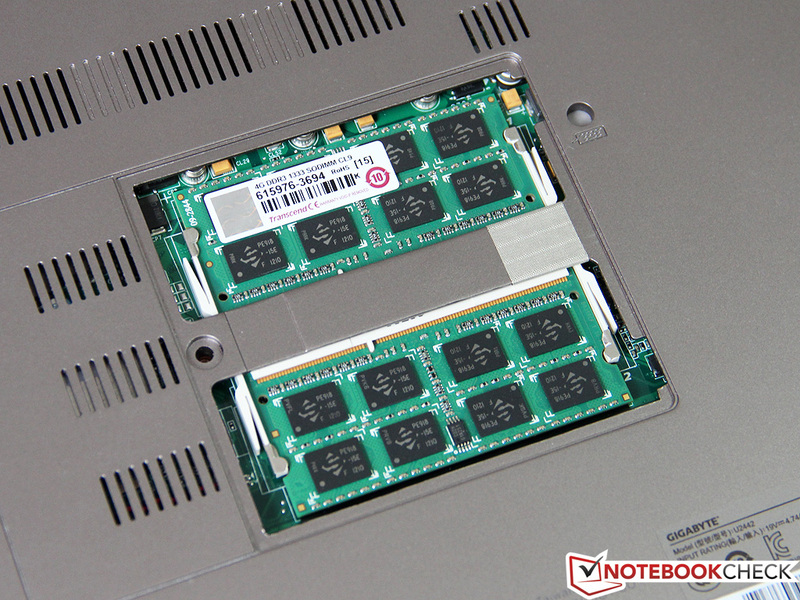 Few notebooks have a weight in this region with such high performance. 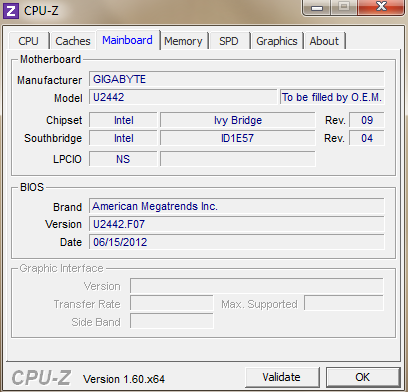 The Gigabyte U2442N can even act as a desktop replacement thanks to the extensive hardware and immense storage space. Who would have expected that from an "Ultrabook"? We found quite a few flaws which dampened our joy. The display is matte and offers a high resolution, but the viewing angles and contrast are not worth of a 1200 Euros investment. The rattling keyboard was also a disappointment. The well-designed cooling employs two fans and ensures good cooling for the CPU and GPU. In fact, it is so effective that even in our stress test, we did not notice any throttling. This is quite an accomplishment for such a compact case. 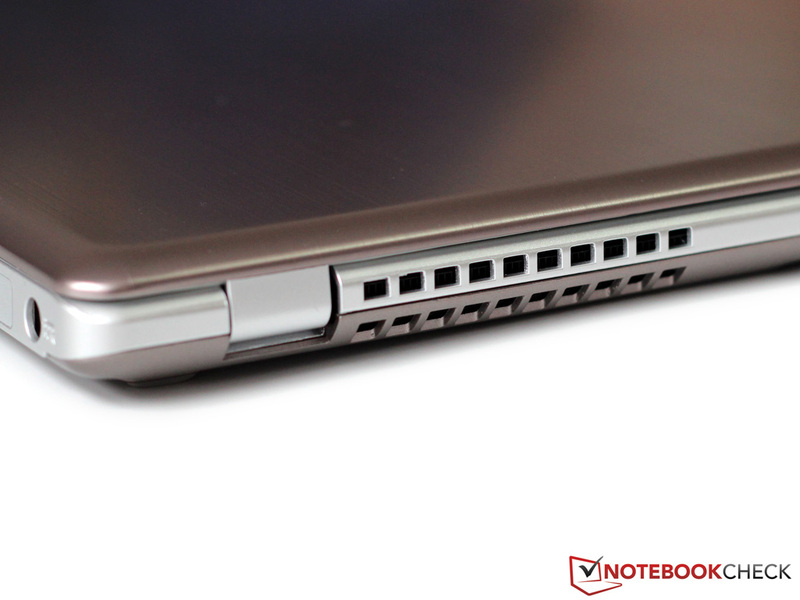 Ultrabooks, or ultra-thin laptops, of the 14-inch class are exotic. 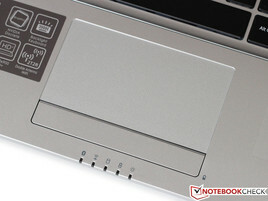 Acer's Aspire TimelineU M5 and the HP Envy 14 (available with Ivy Bridge) are two of the few competitors. 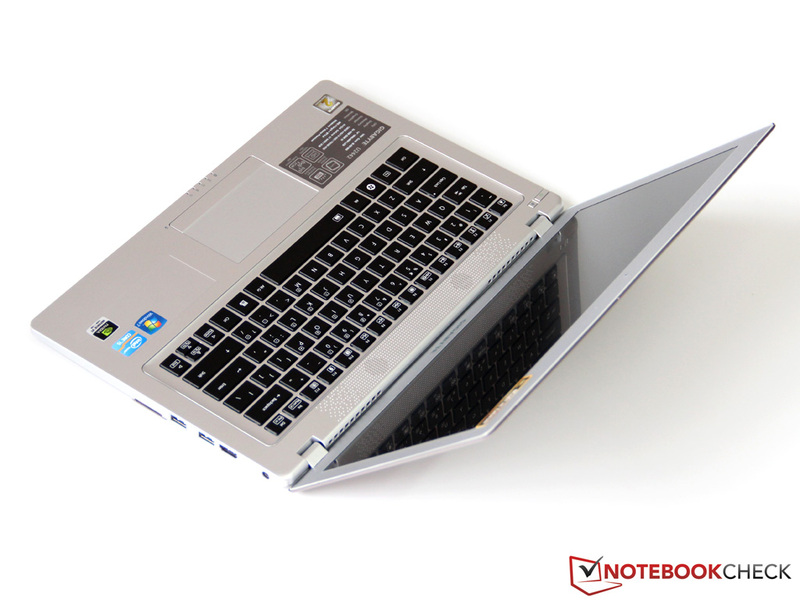 The 13-inch class holds many more competitors like the Dell XPS 13, the Asus UX32VD and the Samsung 530U3C.